I am delighted to be leading an introductory workshop at ‘The Lookout’ in Hyde Park on the morning of 16th March 2019, 10am to 1pm. This event is organised by the Royal Parks. 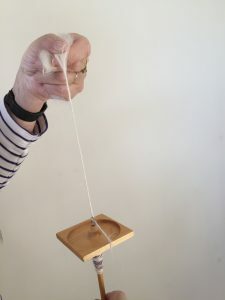 The cost is just £25 for the session, including a spindle and some additional wool to take home. Book here. I shall be holding the first of what I hope will be a series of relatively informal one day workshops to teach the basics of two dimensional ply-split braiding. This is the technique I use for my ply-split neckpieces. They will be on an intimate scale – a maximum of 5 people per session gathered around my kitchen table – and suitable for absolute beginners. I will start by demonstrating making the necessary 4-ply cords and we will work on creating individual ‘samples’. These can be used as bookmarks, key fobs, luggage identifiers etc. Most people should be able to create a completed sample piece within the day. Sampling materials, the use of gripfids (the name of the tool used for ply-splitting), refreshments and a light lunch are all included in the price of £55.00 per person. You should bring note making materials – perhaps including your camera. 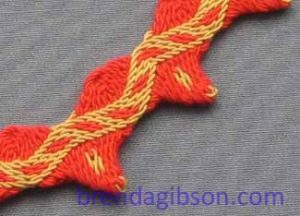 If you wish to continue at home, gripfids will be available to buy and you may like to bring some fine crisp yarns such as cotton, linen or silk as, time permitting, you can make a few cords of your own. The workshop will run from 10:00 am to 4:30pm. To book: Email me with your details: bjg@brendagibson.com and do let me know of any allergies or foods to avoid. Subject to demand, a re-run of the workshop can be scheduled later in November.